New, improved design and durability. Over-molded platform for extra strength. Includes a foot pump, BOSU Integrated Balance Training Manual and DVD. Allows for easy transportation and storage, and quick positioning for any type of workout. 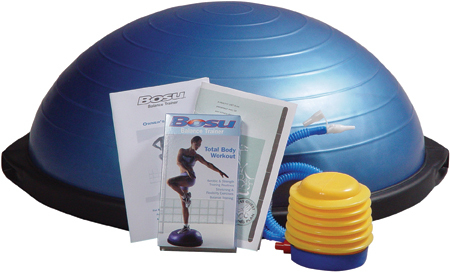 Smaller size offers a variety of configuration and stance options, and complements the original BOSU Balance Trainer. Comes with a foot pump and exercise manual.